This year’s theme is My Voice, My Community. 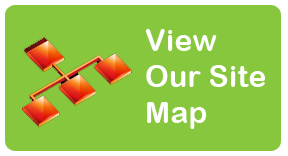 This means making sure that other people know what you think, what you want and what you need. “My name is Emma and I have a son called Samuel who has Down Syndrome. I have decided to write about our experience for this year’s Down Syndrome Awareness week with the theme of ‘My Voice, My Community’. What does my voice, my community mean to me and what can it possibly mean to Samuel when he's not even one yet? Way before I had Samuel I worked as an advocate for children and young people involved with social services. They may have been in care, leaving care or living with a disability and needing the help of social services. The main reason the children needed an advocate was to ensure that their voice was heard by all the adults and professionals involved in their lives. They needed help to make sure the things that were most important to them were not forgotten about in all the plans and decisions that were being made about their lives and so that was my job - it was about making sure people listened. It wasn't about telling the children what to think, feel or say, it wasn’t about making decisions for them (there were enough people doing that), it was about helping and supporting them to put their wishes, feelings and views across in a way that worked for them. Sometimes, this meant drawing pictures, writing poems, writing letters and going to meetings but most of all it involved helping the young person to share their views, making sure the adult professionals listened and ensuring the children had enough information about their situation and options to make some real choices about their own lives. Ironic then that when I had my own my child with a disability I felt completely unable to utilise all the advocacy skills I had developed in my career. It is true that when it comes to your own child, all the training, qualifications and experience seem to vanish into thin air and it can feel like your very first day in a new job, where you know nobody and haven’t had a single days training, oh and there’s no staff handbook. Add to that the complex world of health and social care services and it is easy to feel that, so long as you get to the end of the day and nothing terrible has happened, you are doing a ‘good enough’ job as a parent. Thank goodness then that every now and then, people come in to our lives at a time we need them the most. Maybe they are there for a moment, a process or a reason. They don’t all have the title ‘advocate’ and in fact they rarely do. So, when I look back over Sam’s 2 years on planet Earth, it’s very clear to me that there have been a number of times when people have advocated for us both, sometimes in a very subtle way, like when the midwife that had been with us throughout Sam’s entry into the world put her arm around me and told the doctors to just get on with telling me that Sam had Down syndrome rather than tip-toeing round the edge of the subject. There was also the time when the health visitor told a group of professionals involved in Sam’s life that although we had managed the reduction in service provision in our area for children with disabilities, it wasn’t ok for us to keep having our service cut, Sam had a right to these services and a solution needed to be found. There was also the time when I sat in our doctors’ surgery crying because it was the 6th time over a 3 month period Samuel needed antibiotics. The doctor was so supportive and wrote to the necessary people to ensure Samuel was given access to an alternative medication. These days I find myself thinking about what Samuel would say if he could speak. I often think about children and young people who can't communicate and what they would tell us if they could. Even though we have the law on our side and UN convention on the rights of the child, I think it comes down to the language of the heart. I often think that if vulnerable children and children with disabilities in our society don't deserve the best we have to offer then who does? I mean really, is there any other answer? When I found out that my new baby brother, Isaac had Down syndrome I was quite unfazed by it. At the time I was twelve years old and knew very little about Downs.Despite this I felt that all that mattered was that he was my brother, a cute, pink-faced chubby baby, not unlike any of my other siblings had been. I had already met and held Isaac before I was told about the Down syndrome. This allowed me to make a connection with him without pre-judging him because of his condition. We were lucky that Isaac was a well baby and so there did not seem much for me to worry about. He came home from hospital on Christmas Eve and was the best Christmas present we could have had! 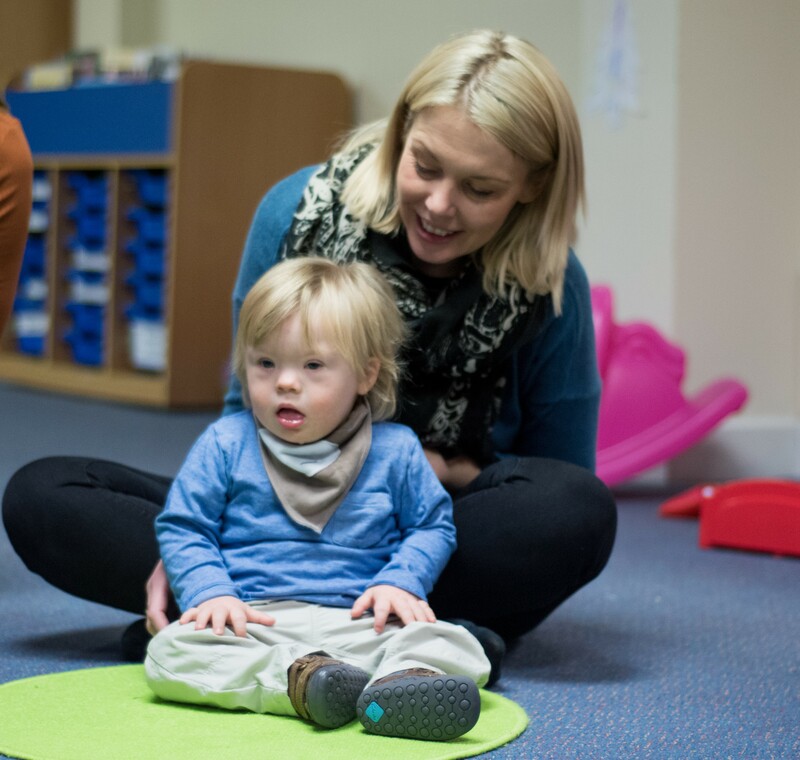 Mum warned us that because Isaac's development would be delayed, it would take him longer to go through each stage of life and as a result might take up more time than an ordinary child might. Having three other siblings already, I was well used to sharing Mum...and I always knew that there was enough of her to go around! Two years on, it has been true that he's learnt things more slowly and needed lots of encouragement, but we've all shared his steps in life and enjoyed all the excitement that each new achievement has brought. He's great fun but just as prone to winding up his sister as any other two year old would be! People often ask me if it upsets me that Isaac has Down syndrome and my answer is always "no". If I tell people that my brother has Downs, they often reply "Oh I am sorry!". My answer then is "Don't be, I'm not!" This surprises them, but it doesn't bother me at all..he is just my little brother and he wouldn't be Isaac without the Downs. I do sometimes wonder what he might have been like without Down syndrome but I have NEVER wished that he was 'normal'. People sometimes assume that I am embarrassed to have a disabled brother, but all my friends love Isaac too. My Dad is much more embarrassing to have around than my brother!! I want my friends to get to know Isaac and see that he is not what they think he is. Far from being incapable, he is great at using sign language, loves 'reading' to himself and demands his music on in the car ...now that is annoying!!!! We had one beautiful son and were expecting our second child, feeling very pleased with how life was treating us. At the initial scan, we were told that the foetus was just a bit smaller than normal so over the course of the pregnancy we had several additional scans but everything seemed fine. My wife, Gillian, went into labour and everything went perfectly through the birth although the midwife was rather quiet in retrospect. 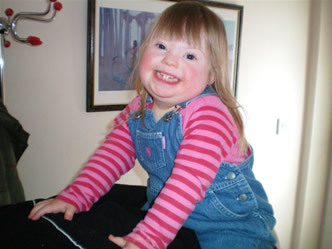 Once everyone was cleaned up, the midwife took Gillian’s hand and said she suspected our baby girl had Down’s syndrome. I stood in the delivery room and the life just drained out of my body. All our hopes, all our dreams, everything was finished. I stood over our baby and just wanted her to die. The doctors and staff were reasonably supportive but we were warned about what was to come. Rachel might not walk, she would have potentially severe learning difficulties, she would be completely passive and would need intensive support for the rest of her life. We were told to make the most of her over the first year because everything would become so much harder after that. Over the next few tear-filled days, all sorts of thoughts came rushing at me – what will she look like, will they take her at nursery, will she go to school, will we have to sell the house to pay for care, how will she ever have a relationship, who will look after her when we’re gone. I wanted nothing to do with her and used every excuse to avoid touching her or looking at her. It just wasn’t fair. Baby Rachel then suffered further complications and had a life-saving operation at 4 days old. She ended up with a colostomy and a bag stuck to her side that was about as big as she was. Three weeks in the intensive care unit isn’t how you expect to celebrate the birth of your child. It made me feel sick. It was my own Dad who then stepped in. He gave me the telling off of my life. “It’s not about you! Now is when your wife and family need you most. Sort yourself out!” I can’t say that I was much use for those first few weeks but when Rachel went in for a further operation and the colostomy was reversed, things started to look a little better. Gillian and I cried most days but less frequently as time went on. When Rachel was 9 months old, I sat with her in my arms at Christmas and watched England win the Ashes on DVD. Over those couple of days, looking at her little face, her helplessness and her innocence, it was like a switch had come on…I looked at her and loved her so much I felt I would burst. We haven’t looked back since then. Rachel does everything that most other children do – she torments her older brother by wrecking his toys, she steals toys off her younger brother, she plays football in the garden, she goes to nursery and she has her own interests. She’s active the whole time, she’s funny, she’s challenging and she’s beautiful. Rachel communicates with us via sign language and her speech is developing each day. One of the best parts of the day is coming in from work and hearing her shout “Daddy” at the top of her voice before she runs into the hall for a hug and a kiss. There’s nothing passive about our little girl!! As for the future, one thing I have learned is that there is no point worrying about it. Rachel has surpassed every one of our expectations and will continue to do so with our help and support. I love her more than words can say and wouldn’t have her any other way. 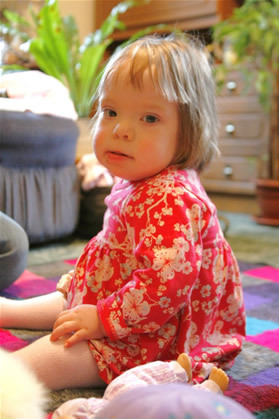 When we had the triple test, we were told that we were more than likely to have a child with Down’s Syndrome. We decided to tell family and friends straight away. The more we said, “We’re expecting a baby, it may have Down’s Syndrome” the easier it got. Looking back it helped us tremendously when Emily was born as there was a lot less explaining to do. During the pregnancy and throughout the first year we worried about everything. What would the future bring for our daughter? What opportunities are out there for her? How capable would she be? What would she look like? How would other people react to her? During that first year after she was born we were bombarded with information, advice and visits from professionals from all sorts of places. Yet the bit of advice that sticks in our minds more that anything else was “You’ll look back in a year and wonder what all the fuss was about”. The lady who told us that was absolutely right. 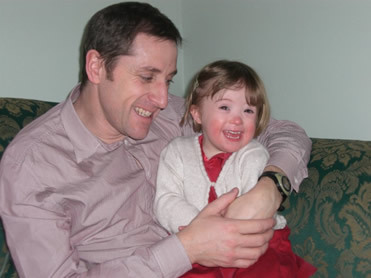 Emily had heart surgery at five months and any concerns we had about Down’s Syndrome paled into insignificance. As soon as the surgery was over she was a different little girl. Now fully recovered, she has come on in leaps and bounds. Emily surprises us again and again with what she can achieve. All of those initial first worries have been proved unfounded. The Down’s Syndrome is just one aspect of Emily’s life. After a while, you don’t see the Down’s Syndrome you just see Emily. She’s amazingly like her mum and dad (and has a temper to match too!). When Emily was born the Downright Special Network didn’t exist and as new parents with a chid with DS we felt quite isolated. Hopefully that doesn’t have to happen now with parents. The Network is there to give help and support. We have met and made some firm friends along our journey. Our beautiful little girl will be three in October 2008 and is the absolute light of our lives. We are extremely proud parents. We were both so excited when we found out I was pregnant. We had so many dreams and ideas. These were all shattered though when a problem was found at our 12 week scan. Our baby had nuchal thickening - the skin fold at the back of her neck was thicker than it should be. The hospital staff explained that this could mean many things, one being that our baby had Down Syndrome. We decided not to have an amniocentesis as I had had a miscarriage previously and didn't want to risk another one (the risk is approximately 1%). As the weeks went on, more abnormalities were found on ultrasound scans and we were told many different diagnoses. Edward's Syndrome was becoming more and more likely. As most babies with this condition do not survive we decided we wanted to know for definite and went ahead with the amniocentesis. When we were told our baby had Down Syndrome the initial overwhelming feeling was of relief. We knew bits and pieces about Down Syndrome - we could handle this! Then reality started to sink in. Would she be able to talk? Walk? Would she have friends? Could she go to school? Would she ever be independent? The sleepless nights started long before our baby was born. However, I think knowing the diagnosis in advance helped us prepare. We got a lot of our initial panic out of the way before she was born. We could tell people in our own time and find out as much as we could in advance. I don't think you can ever be fully prepared though. Amy is two years old now. We have our up days and our down days. Sometimes everything feels like an uphill struggle and so very unfair. With the support of our family and friends and the Downright Special network, we've battled prematurity, feeding problems, pneumonia, constipation, delayed mobility and speech... the list goes on. But other days are wonderful and it feels such a privilege to have her with us. She's growing into a beautiful little girl. She can be funny, charming, cheeky, stubborn and sometimes just plain naughty, just like any other child. I wouldn't change a thing about her. She is who she is and I love her to bits. We are so incredibly proud of her.